NDP Leader Thomas Mulcair made a good suggestion last week. After the Prime Minister publicly outlined the marching orders for his ministers – which did not address recent tensions with First Nations but did emphasize the allocation of funds and resources towards a handful of historical celebrations – Mulcair took him to task. Picking up perhaps on the contradiction of funding historical celebrations while systematically gutting Library and Archives Canada and Parks Canada (two key institutions that preserve Canada’s documentary and material heritage), Mulcair gilled the Prime Minister on his political use of the past. Rather than throwing the baby out with the bath water, however, Mulcair suggests that perhaps the Prime Minister expand his commemorative agenda. 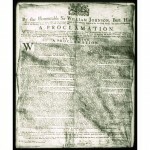 Why not celebrate the 250th anniversary of the 1763 Royal Proclamation this year? I agree with Mulcair. The Harper government should embrace the Royal Proclamation. Not only is it a foundational – one might even say constitutional – document in Canada’s legal history, it also provides the Prime Minister with an opportunity to demonstrate his apparent concern for First Nations’ priorities. The Royal Proclamation has all the trappings of a Harperesque vision of the past. It draws together the military, monarchy and a firm spirit of law and order. I don’t think Mulcair went far enough in his indictment, however. It’s not just Stephen Harper (and his cabinet) ignoring the Proclamation. It’s all of us. I fear that without more concerted effort, the idea of commemorating the Royal Proclamation will merely serve as a political foil used to prod and criticize the Prime Minister and his allies without taking the time to more deeply consider the meaning and implications of this important document. If ever there was a good time to engage in this re-evaluation, #IdleNoMore and the events of the past two months have laid a useful context on which this commemoration can occur. Here, we – this includes you and I as well as the Government of Canada – have an opportunity to allocate resources towards better understanding this important chapter of our past. 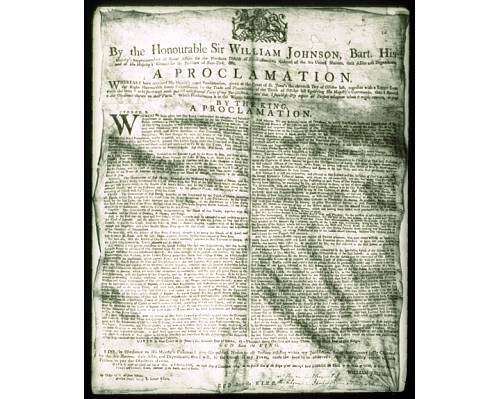 George III issued the Royal Proclamation on October 7 1763. It did three things. First, it established the boundaries and governance structures for four newly acquired colonies: Quebec, East and West Florida and Grenada. It also annexed Ile Saint Jean (Prince Edward Island) and Cape Breton to Nova Scotia. Second, it established grants in land for veterans of the Seven Years’ War. Finally, it extended the crown’s claim to indigenous territory unoccupied and previously unclaimed by the British crown or its subjects. It is not surprising that the Conservatives have not embraced the Royal Proclamation. As the rest of the eighteenth, nineteenth and twentieth centuries turned out, neither government nor colonist fully adhered to the law. The clearest examples are in the Maritimes, Quebec and Ontario where settlement and resource exploitation often preceded treaty making and imperial/indigenous negotiation over territory, but the dismal follow-through on the clauses in many of the Numbered Treaties are also illustrative. Many of the books Andrew Watson and I listed in January to contextualize #IdleNoMore provide tangible examples (check out the comments section which adds a considerable number of excellent resources). Of these, chapter three of J.R. Miller’s Compact, Contract and Covenant is perhaps the quickest study of the Proclamation and its impact. Exploring the legal ramifications of the Proclamation will likely require that the Prime Minister take First Nations concerns more seriously, resulting in significant changes to our country’s constitution. So, like the Charter of Rights and Freedoms, whose 30th anniversary was similarly ignored last year, the Royal Proclamation will likely end up in the dustbin of Conservative history. It is surprising, however, that the issue hasn’t had more resonance in the public and among historians. In 2007 and 2008, my inbox was full of exciting conferences and academic projects focused on the Seven Years’ War and the Conquest of Quebec. The following year, 2009, produced a number of new insights into these mid-eighteenth-century events and their memory. This is perhaps best evidenced through John Reid and Phil Buckner’s recently published two volume Revisiting 1759 and Remembering 1759. Aside from Stephen Conway’s chapter in the first volume, however, the Royal Proclamation is scantly mentioned in either tome. Here I should come clean. My own chapter in the first volume – one of the few that directly addresses the impact of the conquest on indigenous people – spends little time addressing the Proclamation. A focus on the Proclamation wasn’t the explicit purpose of either book. The point is, however, that in our fervour to remember the Conquest of Quebec – the history of Canada’s two ‘founding’ nations – we have not yet adequately revisited and addressed the Royal Proclamation and the legacy of this document for Canada’s relationship with North American indigenous peoples. In some ways our emphasis on the Conquest still reflects a historiographical context that only considers Canada’s French and British heritage. Of course, we don’t necessarily need an anniversary to generate good scholarship on a particular historiographical issue. Alain Beaulieu, John Borrows, Colin Calloway, Denys Delage, Jean-Pierre Sawaya and Brian Slattery have all made important contributions over the past decade that have helped to shape our perspective on this important document. There is undoubtedly more to come in the future from these scholars and others. But what anniversaries and commemorative events do well is provide the opportunity for debate and discussion. In the midst of #IdleNoMore and a resurgence of public awareness of indigenous activism and issues, this is an opportune moment for us to begin asking important questions about how we perceive Canada’s historical relationship with indigenous peoples. On an event-by-event and place-by-place basis, indigenous people now have greater prominence in North American history. Though it has not yet manifest itself in survey textbooks in Canada, over the past twenty years historians have radically re-evaluated the period before 1800, demonstrating the continued presence, power and sovereignty of many indigenous societies. Commemorating the Royal Proclamation provides us with an opportunity to more broadly integrate these perspectives into our understanding of Canada’s past. With October still eight months away, there’s still time to commemorate and learn about the 1763 Royal Proclamation during its 250th anniversary. So, some dead people, made a deal with other dead people. And now I get to be their slave forever? Go fuxk yourself. Get a job, make a job, stop demanding money from me. Idle no more, work. Oh yea, I forgot to mention that the king, Georgey boy. Was insane. How could the Proclamation of 1763 be relevant somehow to unknown tracts of land? Reading the original document it was specific about lands to the east of the Mississippi , and rivers that drain into it that flow to the Atlantic. That leaves all areas to the West as not considered in this document. With these facts in mind, why would the Prime Minister give it any cause celebre in 2013? It is because the public vote is not working.